At times, such lofty musings are founded, say the time when I opened up a folder housing pictures of missionaries in black face, or that other time when I found a document describing the inferiority of the female gender and how to accommodate this on the mission field. Smug musings were duly appropriate in both instances. Today, the opposite experience happened when I opened a pamphlet titled, The Memorandum on the Further Development and Expansion of Christianity in India, written by the Christo Samaj in 1921 to J.H. Oldham, the secretary of the International Missionary Conference (IMC). 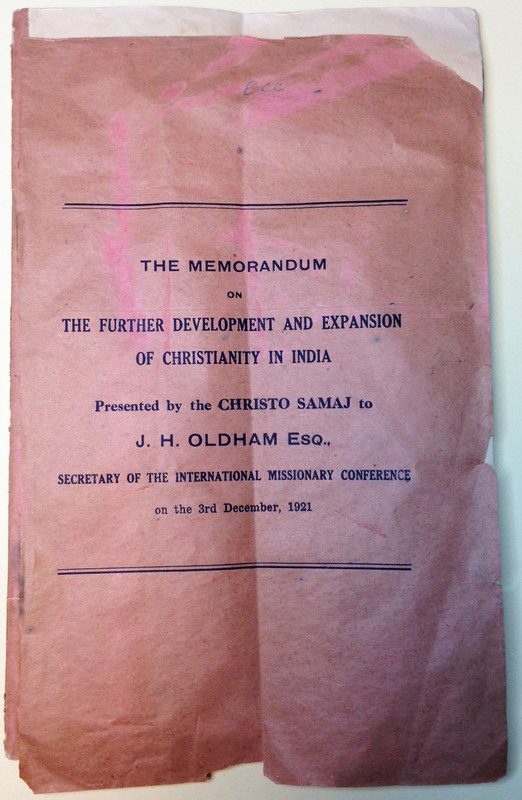 This pamphlet is part of the Missionary Research Library Archives, series 3: South Asia. As I browsed the pamphlet searching for historical information to write the finding aid for this single-item collection, I came across ideas, phrases, critiques, and suggestions that could be heard in a Union Theological Seminary theology course addressing liberation theology, racism, Western imperialism, and other such themes (though these express terms are not used within the document). I could hear voices similar to that of my doctoral adviser, Brigitte Kahl, a New Testament scholar who specializes in critical re-imagination and empire-critical methodologies, speaking against the economic and ideological imprisonment experienced by indigenous Christians at the hands of Western Imperial Christianity. I kept glancing at the date of this well-written, brilliantly articulated document, 1921, and wondering why these same sentiments continue to serve as novelties and mind-blowing conceptions for first-year Master’s students coming to learn about liberation theology in New York City, 2013. Church fathers in Madras a hundred years ago were talking about colonialism, racism, white, Western paternalism, and the dangers of imparting fractured systems of Western denominationalism into indigenous non-Western cultures. Church fathers in Madras were complaining of the socio-economic disparity between white missionaries and indigenous persons, demanding that missionaries live as those they serve, also highlighting the subpar nature of many missionaries as persons who were not employable in Western culture, so were farmed out overseas, bringing their idiosyncrasies and issues with them onto the mission field. The question I want an answer to is this: why is this the first time I am hearing about the Christo Samaj? As a doctoral student who has a Master of Divinity degree, and one who engages in frequent conversations with peers regarding social justice issues, liberation theology and the like, this pamphlet holds the seedlings to undercurrents and movements giving rise to postcolonialism in India and should be treated as a source document for studies surrounding postcolonialism and theology. I am happy to report that the item is now processed and available for everyone to access, and I certainly hope that many, many people find the precious time to do so. This entry was posted in Collections on January 8, 2013 by Amy E. Meverden.